Hi guys, most of us at some instance of time face a problem about how to start something for a minor or major project. Many of us wish to make a website based project but do not know how to proceed. 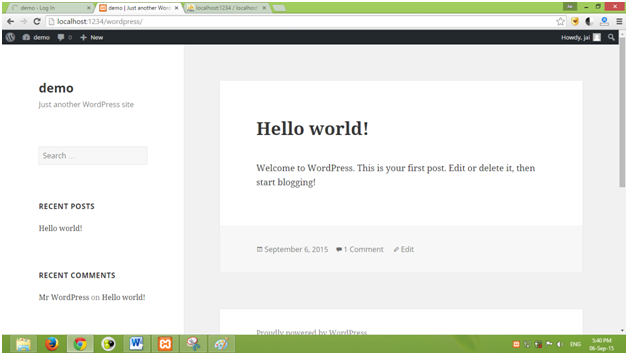 To assist all my friends, today I’ll walk you through the process of installing and getting acquainted with WordPress environment. 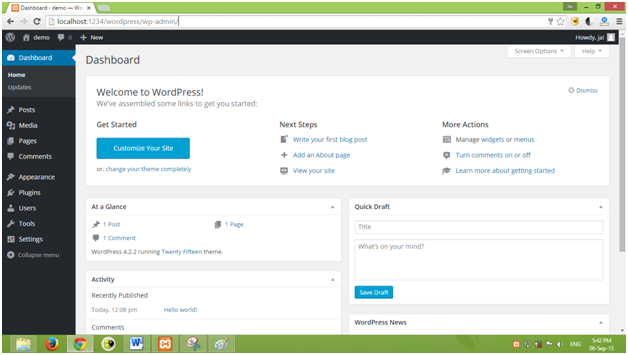 Below I give step by step process along with the screenshots to make a website using WordPress. Just follow them and you are done!! Go to the link :https://www.apachefriends.org/download.html, choose your platform (windows / linux, mac) and click on download. 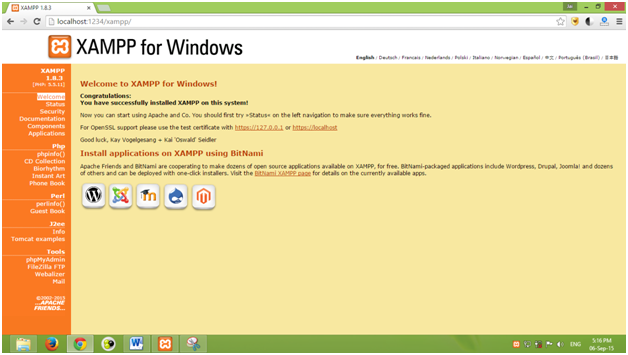 After installing Xampp , go to programs and run it, you should see something like this. Just click on start in front of Apache and MySQL, this will start your localserver. In case you’re facing problems with this step , chances are that your port no. 80 is being used by other application (for example : Skype). To resolve this issue, click on config in front of Apache, locate the line “Listen 80” and change it some other value, say “Listen 1234”. Now that your localhost is running , check it by typing “localhost” in your browser url (if you changed the port number in 3rd step , then type “localhost:1234” whenever i refer to “localhost”). You should see the following screen. 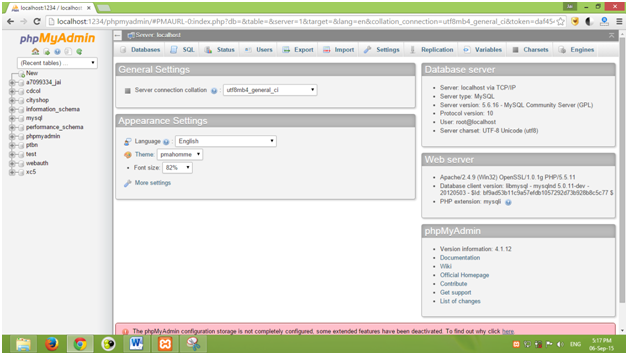 Goto phpMyAdmin located under “Tools” in bottom left corner. This is your MySQLdatabase, here all the information of your website (comments , posts , username , password, etc.) are stored. You can run SQL queries here, make tables, etc. 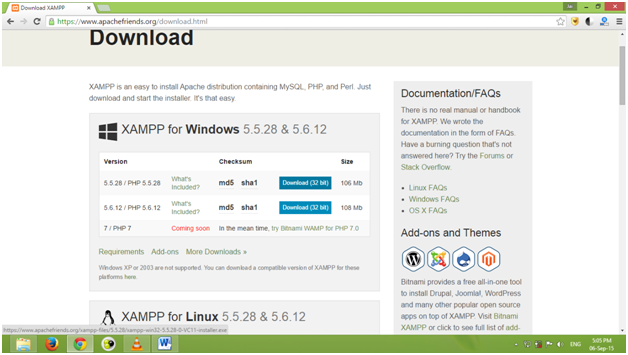 Now go to C:\xampp\htdocs and paste the zip file you downloaded in step 6 here. Extract the zip file in the htdocs folder and you should see a new folder named “wordpress” created. Write any name you want under “Database name” and click on create. Remember this name, this is the name of your site’s database. Type the url “http://localhost/wordpress/” in your browser and you should get this screen. Database name : The database you created in step 9. Password : Leave it empty. Table prefix : Its “wp_” by default, you can change it whatever you want, but you can’t keep it empty. On the next screen just fill in all the details like site name, username, password, email. Remember the username and password you choose are the Admin login credentials, so keep the password secure and strong, anyways you can change it later if you want. 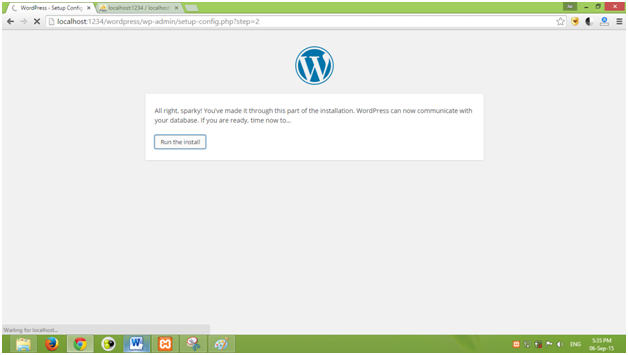 Click on “install wordpress”. On the next screen you’ll be asked to login using the credentials you created in step 13, just do it to make sure everything is working. That’s it , you are good to go ! 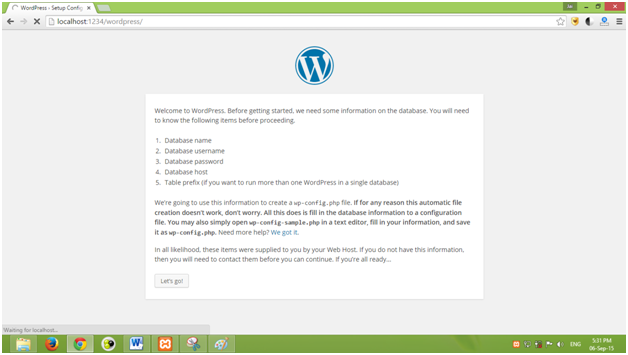 Enter the url “http://localhost/wordpress/wp-admin/” and you’ll see the admin dashboard similar to this , here you can customize your website , about which we will be learning in “How to make a website using WordPress (Part – 2)” . Thank You and catch you soon ! !